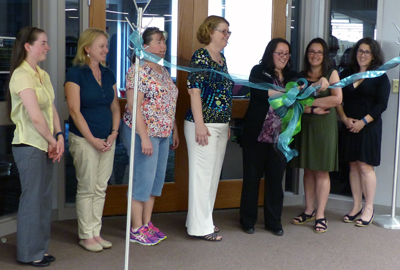 The Bellingham Public Library staff held a grand opening for the library’s newly renovated teen room on May 12. After receiving approval for the project funds at Town Meeting last October, they began the bidding process, and construction began shortly after. Library Director Bernadette Rivard couldn’t be happier with the contractor and the pace of the process. 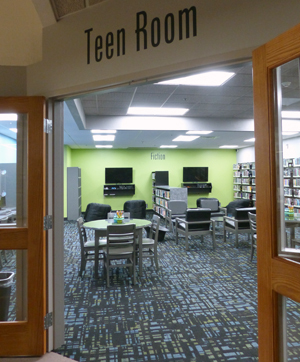 In fact, the renovation of the Teen Room has been on the list of library needs for many years now. “This plan was first identified as a need nearly ten years ago,” Rivard explained, “after the new high school opened and the fifth and sixth grades moved to the current middle school.” With the location of the library between the high school and the middle school, nearly 1,500 fourth through twelfth graders are in walking distance of the library. It’s not uncommon to have at least fifty teens in the library during the after-school hours. With the fourth-graders now located at the middle school, and the expansion of the parking lot complete, the project moved to the top of the list of priorities. The renovation will enable the after-school program to be held in the same space as library collections, so the students have access to books and technology. It will also free up the community room for other groups and solve a long-term staffing problem for the library. The new space will include areas for crafts, homework help, games, and Internet computers. The library staff envision the students participating in programming designed around those topics and using the public Internet stations for homework and entertainment. While $122,000 was approved at Town Meeting, the project was bid at $147,000. The trustees voted to go ahead with the project with state-aid funds and fundraising money from the Friends of the Bellingham Library. Existing furniture was repurposed and repainted to match the new room, and the Friends of the Library assisted funding a portion of the approximately $20,000 for equipment and furnishings for the new room. “We have been on board with the YA renovation since last fall, in supporting the initial Town Meeting,” said Jane Vichi, president of the Friends. They supported the renovation with many fundraisers, and she would like to thank Pour Richards in Franklin for a successful wine and cheese fundraiser, as well as Rock ’n Coal Restaurant, where a musical bingo night was held. In addition to an ongoing donation jar, funds were raised from the spring book sale, as well as a paint night held at Artworks Studio in Hopedale. She praised the support of Bernadette and the library staff. “None of this is due to a single individual,” Vichi says. “It’s been a lot of teamwork.” As well as support from the Friends, the library would like to recognize the contributions of Charles River Bank, the Bellingham VFW Men’s Auxiliary, Barbara and Russell Selvitella, and BNI Go Getters for their donations. Jane would also like to recognize the staff for going above and beyond in supporting the project. The previous after-school program was held in the community room; the library’s hope is that with the teens in their own space now, the community room will be open to other programs in the afternoons, including specific programming for the fourth to seventh grade level. As for the future, Rivard explained that the library is already looking ahead. Information about the library programs can be found on the library’s website, www.bellinghamlibrary.org. The Friends of the Library are always looking for new members; information can be found at www.bellfol.org.